"He could also have killed the wife... However, he preferred not to do so as she was a mother holding two of her children in her arms, and thus he proved that 'morals have a place, even in war'"
"Israeli affairs expert" Fayez Abbas: "Are they [Arab members of the Israeli Parliament] the reason that the young person (i.e., terrorist Omar Al-Abd) from the village of Kubar entered the settlement [of Halamish] and killed 3 settlers in response to what is happening at the Al-Aqsa Mosque? ... This is the picture of the children claimed to be rescued, but there is a different story: The young person (i.e., the terrorist) knew there were children and refused to harm them, at least according to the Palestinian [reports]." The real reason the children were unharmed was because the mother of the children, Michal Solomon, hid with them in another room and locked the door while her husband, Elad, was being stabbed to death. Elad fought with the terrorist, which bought time for a neighbor to shoot the terrorist and stop his killing spree. 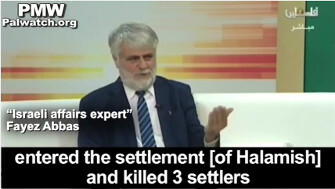 "Omar Al-Abd succeeded in killing 3 settlers and wounding a fourth during his operation, but he could also have killed the wife of one of the 3 settlers that were killed. However, he preferred not to do so as she was a mother holding two of her children in her arms, and thus he proved that 'morals have a place, even in war.'" 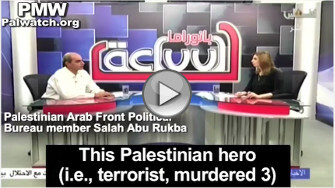 Palestinian Arab Front Political Bureau member Salah Abu Rukba: "This Palestinian hero (i.e., terrorist, murdered 3) infiltrated the Israeli settlement and carried out this brave operation. He made sure not to harm the children in order to say to the whole world that the Palestinians are merciful but they are defending their rights, even if these means are not acceptable to some of the countries of the world. But the Palestinians don't have [a choice] other than to confront the occupier with all of the legitimate means." This is not the first time that Palestinians have portrayed a terror attack as "moral" because the terrorists did not kill or attack children. Palestinian Media Watch reported on the PA's morals regarding murder and the portrayal of the killers as "merciful" in three attacks in 2015: The murderer of Ya'akov Litman and his 18-year-old son Netanel, who "spared" Litman's wife and other children; the murderers of the Henkin couple who were killed in their car in front of their children who were left "unharmed"; and the murderer of Dafna Meir who was killed in front of her children in her home. 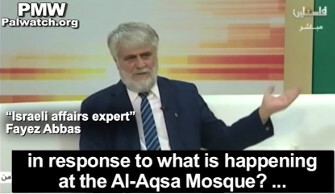 "Israeli affairs expert" Fayez Abbas: "Are they [Arab members of the Israeli Parliament] the reason that the young person (i.e., terrorist Omar Al-Abd) from the village of Kubar entered the settlement [of Halamish] and killed 3 settlers in response to what is happening at the Al-Aqsa Mosque? ... This is the picture of the children claimed to be rescued, but there is a different story: The young person (i.e., the terrorist) knew there were children and refused to harm them, at least according to the Palestinian [reports]... (Reading from Israeli newspaper): 'The mother of the children, says: I heard the one carrying out the operation say in Arabic: What is your name?... I understood that something bad was happening, and I quickly took the children to the second floor and I heard the sound of shooting.'" Official PA TV host: "If she says she took the children, so he (i.e., the terrorist) did see them." Headline: "Halamish - the ugly face of the occupation"
According to Channel 10, the female settler whose life he spared was the reason for the wounding of Al-Abd and his arrest, and she was the reason he was prevented from leaving the settlement in peace after carrying out the operation, after she hurried to call the occupation forces who reached the place quickly. (PMW was not able to find any such report published by Channel 10 -Ed.)" Elor Azaria - a 20-year-old sgt. and combat medic in the Israeli army who shot 21-year-old Palestinian terrorist Abd Al-Fattah Al-Sharif in the head as he lay wounded on the ground and killed him in Hebron on March 24, 2016, shortly after Al-Sharif, together with 21-year-old terrorist Ramzi Aziz Al-Qasrawi, had stabbed and wounded an Israeli soldier. Al-Qasrawi was shot and killed during the attack. Azaria has stated that he shot Al-Sharif because he saw him moving and thought he might have a bomb on him and be trying to detonate it - other sources, including a Magen David Adom investigative committee and a military criminal investigator, have confirmed that this possibility had not been ruled out. The shooting and killing was filmed by a Palestinian activist of the NGO B'Tselem. Azaria was condemned by many Israeli politicians and officials following the incident, particularly then Defense Minister Moshe Ya'alon, and Azaria was put on trial on charges of manslaughter. Azaria was convicted of manslaughter in January 2017 and sentenced to 18 months in prison. Azaria is appealing the conviction. The terms "all means", "all means of resistance," "all forms," are used by PA leaders to include using all types of violence, including deadly terror against Israeli civilians such as stabbings and shootings, as well as throwing rocks and Molotov Cocktails.